The story of Bill Barilko was well-known to hockey fans a half-century ago. But, it wasn’t until 41 years after his heroic goal and disappearance that his strange tale was reintroduced to the mainstream by one of Canada’s all-time great bands. The Tragically Hip’s ’50 Mission Cap’ succinctly recounts the summer of 1951 in the song’s verse. Given that the song sheds light on the strange coincidence/cosmic fate of the Maple Leafs’ Stanley Cup fortunes and Barilko’s disappearance, it seems additionally fitting that the song — from The Hip’s fourth album, Fully Completely — was released in 1992, the year Barilko’s number was formally hoisted to the rafters by the hockey club. Since that release, The Tragically Hip and Bill Barilko have been tightly woven together in their corner of hockey lore. One of the band’s most popular and recognizable songs coupled with one of hockey’s most unique and unlikely stories. The bond between the two was cemented in 2001 as the Maple Leafs got set to drop the puck on their second round playoff series. On May 1 — 50 years and 10 days after the Leafs captured the 1951 Stanley Cup on Barilko’s OT winner — the Maple Leafs held a pre-game ceremony to honour Barilko. Present at the ceremony were Anne Klisanich (Barilko’s last survivng sibling), eight members of the 1951 Stanley Cup Champion Maple Leafs (Gus Mortson, Harry Watson, Danny Lewicki, John McCormack, Bob Hassard, Fleming Mackell, Sid Smith and Cal Gardner) and The Tragically Hip. The ceremony began with a tribute to Barilko’s banner above the Air Canada Centre ice. Afterwards, The Tragically Hip presented Klisanich with the hand-written lyrics to the song “50 Mission Cap” and the hockey card referenced in the song. 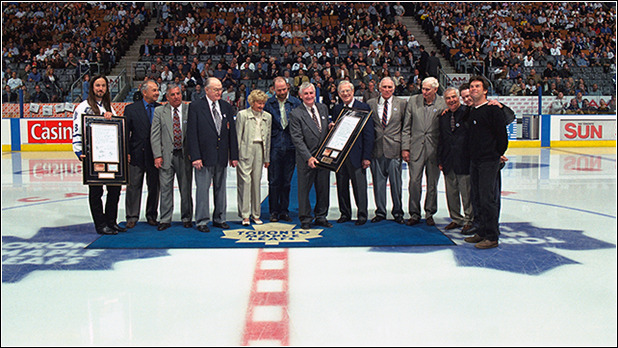 The Maple Leafs were also presented with a copy of the handwritten lyrics to the song. The lyrics were immediately put up in the club’s dressing room. They remain the only unchanged item in the room since 2001. In addition to their status as the pride of Kingston, Ont., there is no denying band’s standing in Toronto. At Air Canada Centre alone, the band has played 13 shows. Among those 13 are the first in the building’s history and a show on December 31, 1999 that welcomed a new millenium on the Air Canada Centre stage. On August 10, 2016 — officially The Tragically Hip Day in Toronto following a proclamation from Mayor John Tory — we get set for the first of three shows in Toronto. They are potentially the last three played by the band in the city. “That night in Toronto” is the starting point for a story from one of many memories and many nights in Toronto. Many nights that have spanned a 30-plus year career at the forefront of Canadian music. A career that has captivated crowds at Maple Leaf Gardens, Air Canada Centre and venues across the city. A career that has physically imprinted the band on Toronto’s streets as part of Canada’s Walk of Fame. Ask someone on a street corner if they have a Hip story and the odds are good they’ll deliver. If you’re reading this, you may have your own. Come on down to Air Canada Centre and you can deliver it on video. Whether a Hip singalong at a cottage, making the two-hour trek to Bobcaygeon with 25,000 other fans to see the band perform in the setting of the eponymous song five years ago or simply taking the time to learn more about Bill Barilko after listening to ’50 Mission Cap’, everyone has a story. Every time Torontonians were asked to wait and see, tomorrow brought The Tragically Hip back to town. With the imprint they’ve left, it’s hard to distinguish times they’ve ever left. So, as Toronto celebrates The Tragically Hip, here’s to those nights in Toronto, that May 1st night in Toronto, tonight in Toronto and many more to come. Until the next one, the lyrics to “50 Mission Cap” — alongside a hockey card — will hang on the wall of the Maple Leafs dressing room, unchanged. A small, handwritten reminder of a pair of immense Canadian legacies.